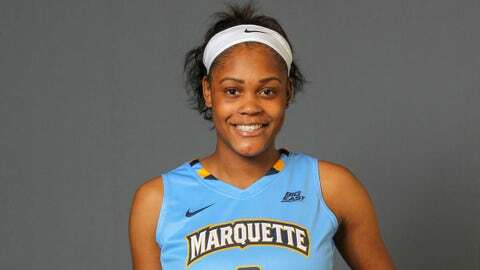 MILWAUKEE — This was supposed to be the year Tori McCoy finally got to play basketball at Marquette. The plan in May 2017 when she transferred from Ohio State was to suit up in blue and gold this fall following a redshirt season. For now, basketball is on hold. A rare kidney disease led doctors to diagnose McCoy in December with end-stage renal failure. She gets dialysis treatments three times a week. Her physicians have determined that the best chance for long-term survival is to have a kidney transplant. Initially reluctant to talk about her condition, McCoy is now speaking out following a lengthy medical evaluation process this past spring. She hopes to also raise awareness for organ donation overall. She knew of 10 people who have been interviewed as of the end of July after coming forward to express interest as possible donors. It is just the first step of a thorough screening process to find a match. “My telephone is a little busier (in McCoy’s case) than someone who has not shared their story,” Jeff Klister, the living kidney donor coordinator at Aurora St. Luke’s Medical Center in Milwaukee. For now, McCoy waits for word of a match. She is inspired by the messages of support received since first sharing her story on Twitter. “I had several people reach out just to tell me, ‘Everything’s going to be OK, not to worry about it because this is just one bump that’s in the road that I can get over,'” McCoy said recently to The Associated Press. There have been many emotionally draining days and nights since her diagnosis. She initially saw a doctor after feeling fatigued over Thanksgiving break. A cold got worse when she returned to campus. Initially, she thought she might have been run down and blue after having to leave her family following the holiday. “And then it just never got better, so that’s when we decided to take it a step further,” she said. She saw a doctor Dec. 6. The next day, she was told that she had Focal Segmental Glomerulosclerosis. It is a condition that affects kidney function by attacking and damaging the glomeruli, which are tiny filtering units insider the kidney where blood is cleaned, according to the National Kidney Foundation. “I love basketball. From that moment on, I thought my life was over,” she said in recounting her reaction after the diagnosis. A former McDonald’s All-American, the 6-foot-4 McCoy averaged 8.1 points and 5.9 rebounds in her only season at Ohio State in 2016-17. She played in all 35 games with 10 starts. Leading the Buckeyes with 59 blocks, McCoy was named to the Big Ten All-Freshman Team. She describes herself as a gym rat when healthy. These days, McCoy can attend practices, but she is otherwise limited to cardio work, as well as working on ball-handling and shooting form. Roughly four-hour-long dialysis treatment sessions can sap her of energy. Some days are better than others. The Golden Eagles can practice this summer ahead of an exhibition trip to Australia. She has taken on the role of unofficial coach during practice. She’ll assume the role again of cheerleader when the games begin. Coach Carolyn Kieger heaps praise on how McCoy has handled her situation. McCoy stays engaged during timeouts. She might make keen observations at halftime or after a game. Knowing that she is on the transplant list, the coaching staff hopes to keep McCoy mentally sharp. McCoy will be able to travel to Australia, where coaches and staff will help make sure she gets to dialysis appointments on the road. If basketball doesn’t work out, McCoy thinks she might go into broadcasting. But she still plans to play hoops, even though McCoy described her doctors as being wary. In a transplant operation, she said a new kidney would be placed in front of her stomach. Two notable cases in the NBA give McCoy hope after former stars Alonzo Mourning and Sean Elliott both returned to play after kidney transplants.